Year-round, educational programming for k-12, college students, and beyond. Almanac is a Roster Artist with Young Audiences of New Jersey and Eastern Pennsylvania, and offers AcroAction!, a specially developed, 45 minute assembly program for grades K-4 (with a focus on, "What can we do together that we can't do apart?") or grades 4-8 (bodies as simple machines). We also offer in-school workshops on teamwork and character values through acrobatics through Young Audiences. 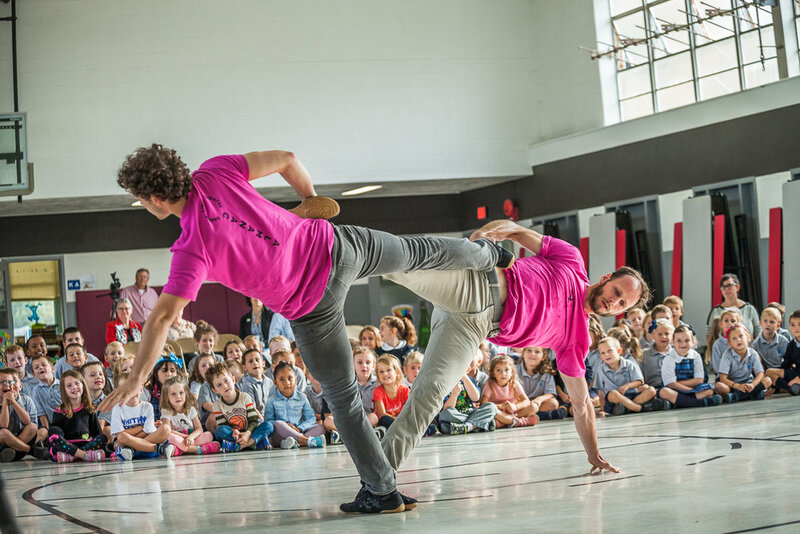 Almanac can build complete performances with groups of students, or add exciting acrobatic, theatre, and dance instruction to an existing arts curriculum. Almanac has taught summer camps in partnership with ASAP, Bearnstow, and camps in the Philadelphia area. We offer a unique pairing of acrobatics, theatre games, and devised theatre technics that allows students to have full control over the creation process. What can acrobatics teach us about the importance of leaving our comfort zones, taking risks, and trusting the members of our teams? What do theatre artists know about communication and collaboration that can apply to a business environment? Looking for an out-of-the-box corporate education experience? Almanac has the perfect combination of skills to reinvigorate employees and give new meaning to the words synergy and collaboration.